I know a lot of authors feel overwhelmed in the digital age of publishing and that is perfectly understandable. But today I would like to pan back and maybe offer a refreshed perspective to keep you pressing. Today we face the challenge of creating a brand. But you might be thinking, “What exactly is a brand?” There is a lot of misinformation floating around so that is a reasonable question to ask. A brand is the power of a name to drive sales. Our name alone compels action. No easy task. Overcoming inertia is critical for any author who wants to make a living doing this writing thing. In an age of instant? This is going to take a while, but hopefully I can help 😉 . Publishers have always struggled to help authors create a brand. This is NOT a new thing. I have mentioned this before, but it bears repeating. According to the BEA (Book Expo of America) statistics of 2004, writers had a 92% failure rate. Only one out of ten traditionally published authors ever saw another book in print. 92% of all books published sold less than a thousand copies (traditionally and nontraditionally published). Why I like using 2004 statistics is this is two years before most of the major social media platforms gained traction. Facebook, You Tube and Twitter all emerged in roughly the same two year period. But before social media? It was a nightmare for publishers to help authors create a brand (unless they were non-fiction authors). Nonfiction authors had far more access to platform building activities—public speaking, conferences, media, newsletters, or their own personal practices. The local news was far more likely to interview a doctor about his new weight loss program than they were to talk to a novelist about dragons or spaceships. Media was almost solely the domain of the NF expert. Why this was so vital was that audiences suddenly had direct access to a writer who might be able to make his/her case and influence behavior. Maybe you weren’t normally a “reader” but that interview on NPR was so cool you just had to buy the book and learn how Hitler really escaped the bunker and the Russians lied about finding him. But for fiction, more often than not publishers had to rely on some confluence of the stars to hope that a new book sold at least respectably. Sometimes writers could launch successful grassroots movements as was the case with The Divine Secrets of the Ya Ya Sisterhood. But, many writers tried this and most of them failed. Grassroots movements are lightning in a bottle even today. But sometimes it worked. And that was cool because then publishers could offer the writer another contract and the brand slowly was built with a volume of titles. Go to any used bookstore and who takes up most of the shelf space? Writers with multiple multiple titles. All of this to say that brands were excruciatingly difficult and slow to build. I know a lot of writers get discouraged today, but we must learn to balance reality and expectations. If we go back to the “good old days” what we have is this. Then we had to buy a Writer’s Market every year and pray the information hadn’t changed, but most of the time it had. I swear agents changed agencies more than my mom changes her mind about where to eat lunch. Then we had to type out a stack of queries, put in mail…then wait. Out of fifteen queries, likely five would be returned with, No longer at this agency. Three might come with No longer looking for X type of book. Another five just would never respond and the other two? Well one would probably be a form letter misspelling your name and the other would be a handwritten note suggesting we stop writing altogether. Oh and every agent would demand “no simultaneous submissions”, but they could feel free to take six months to get back to us…if ever. Just getting published was about as close to an act of God as we could get. And even then? That wasn’t the end of it. Generally it took about a year to eighteen months for the book to be in print. We got paid once, maybe twice a year. If we add up the sheer volume of TIME involved in the old way, why are we griping that we have been self-published three years and aren’t yet J.K. Rowling? I have mentioned the problems with Millennial Authors (these are writers who have “come of age” during the digital revolution and they could be 22 or 67). I know the “old way” wasn’t better, but it does lead me to believe that writers of the “old days” have better tenacity because they didn’t enter the profession in the Age of Instant. Yes, our first book might only sell a handful of copies. But guess what? In the “old days” odds were we would only sell a small number of copies as well (refer to statistics above). But, unlike the “old days” we can keep writing more books. We can keep at it until something sticks or until we decide to move on. Brands take time to build. Only now, with social media, the task is far easier than it used to be. We can build our own platforms and create our own brands and we don’t have to pray for lighting in a bottle the same way we used to. Oh, don’t get me wrong, we are still working toward that magic, only now we have more control. We don’t have to pray our local paper writes about us, or we score a radio interview so the outside world can encounter us. We can start cultivating our audience on our own. Yet, we still have the challenge of creating a brand. Remember, a brand is when our name alone compels action whether that action is buying a book, commenting on a blog, reading a blog, sharing a post, RTing a tweet. The more we can compel action on the part of others, the stronger our brand will grow. Traditional marketing, advertising and direct mail operate linearly. I send X to Y. Best Buy doesn’t expect that when I get a coupon in the mail I will then share it with all my friends. Social media, conversely, operates algorithmically using the power of exponentials. Content flies out along countless vectors as opposed to ONE (which is why it is all but impossible to measure efficacy of social media in the same detailed way). Someone reads my blog and tweets or posts to FB and that post then travels along infinite vectors I may never see. Why is this important? Because our goal is to have a dialogue with others, generate interest and excitement that compels others to share. The problem is that a lot of writers are treating social media the same way as direct mail. Instead of giving, they are taking and we are frankly worn plum out from takers. Every one of us has an inbox filled with newsletters we didn’t sign up for, ads, marketing, and on and on and they all WANT something. We feel like we’ve fallen into some swamp pond and staggered out covered in leeches. Thus, if we default to generating self-serving content (ads, marketing, self-promotion), we shouldn’t be surprised when creating a brand feels like trying to perform brain surgery from space with an egg beater. If we engage in traditional marketing tactics, we have use of ONE vector (us to other party). This means we are beholden to the same dismal ROI (return on investment) numbers of all direct mail which is about a 1%-5% ROI. This means we better have 100,000 twitter followers to get any traction since we have to reach those people directly instead of with the help of a network. If we don’t want to be on every social site and spending our time building up massive numbers (instead of writing), then we need to go back to the content. We can create stuff others want to share because social media is basically Show and Tell for adults 😉 . If we do this, then reaching 100,000 people is far easier since we are not singlehandedly reaching them via one road. Additionally, content will be viewed at a far higher rate since it is “spoken for” by a third party people know, like and trust. Do this long enough and your “following” might be smaller in overall numbers, but those followers will be engaged which will make all the difference in the world. These are the followers we have cultivated to look forward to hearing from us because we are a brand. Ads, marketing and promotion have little momentum without the engine of the BRAND. In the end, don’t get too frustrated. Publishing has always been a slow business. Only now? It’s just slower in different ways. It also feels slower because everything else (besides writing the actual book) is pretty close to instant. So make sure you aren’t being unreasonable in your expectations. It is a heck of a lot faster to publish that book on Create Space than it is going to be to build the audience dying to read it. Just keep improving and keep pressing and keep perspective. What are your thoughts? Do you think we have gotten a little spoiled with instant? That maybe it makes us unreasonably hard on ourselves? Do you want to set fire to your e-mail? 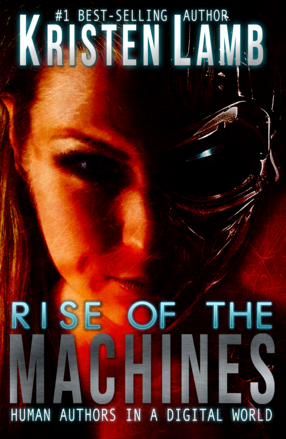 If branding and blogging and all that jazz has you overwhelmed, please pick up a copy of Rise of the Machines—Human Authors in a Digital World or check out the classes I have below. I even have a Social Media Master’s series where you get three classes for the price of TWO. All you need to know to ROCK your book brand.